My mission (should I choose to accept it): To create an original recipe using Prosciutto di San Daniele from Legends from Europe. Legends from Europe is a 3 year campaign funded by the European Union and launched in the U.S. to increase awareness and celebrate “the legendary quality, tradition and taste” of five authentic PDO products (Protected Designation of Origin) from Europe: Prosciutto di Parma, Parmigiano Reffiano, Prosciutto di San Daniele, Grana Padano and Montasio. As luck would have it, these 5 products happen to be some of my favorites. The biggest challenge I faced was not in accepting this mission but deciding which product to feature. Fortunately, the folks at Legends helped me with my choice and assigned me the Prosciutto di San Daniele. Prosciutto di San Daniele is named for the region of San Daniele in northeastern Italy where it enjoys a unique micro-climate nestled between the Dolomite Alps and the Adriatic Sea. The ham is left to slow-cure naturally, following a 2,000 year-old tradition introduced by the Celts. Today, Prosciutto di San Daniele is considered a delicacy with its mild flavor and delicate texture. This week, I will be posting a few recipes I’ve created with Legends’ Prosciutto di San Daniele. Heat oven to 375 F. Halve figs lengthwise. Place figs on a work surface, skin side down. Gently make a small indentation in each center with a teaspoon. Mix goat cheese and pepper together in a small bowl. Fill the indentation with goat cheese, about 1/2 teaspoon. 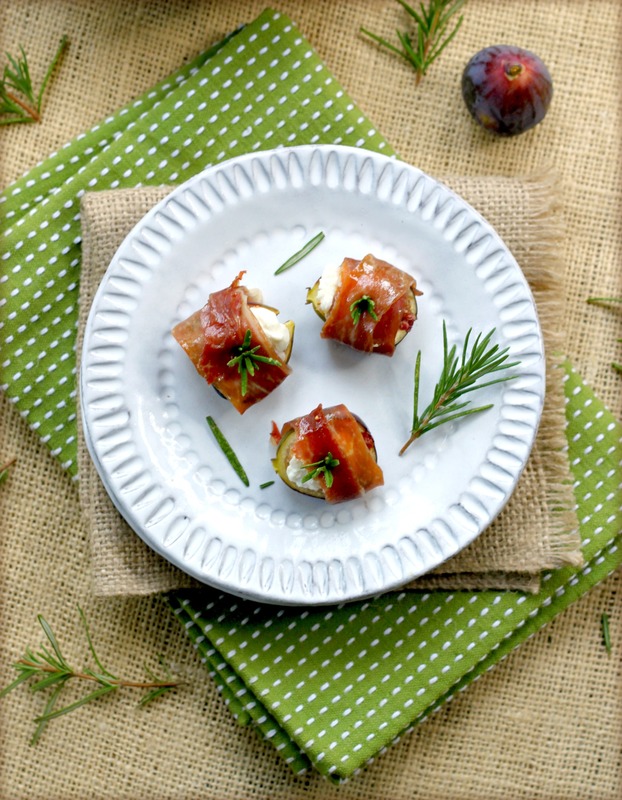 Wrap a prosciutto slice, cross-wise, around fig. Spear a rosemary sprig through the center to hold the prosciutto in place. Repeat with remaining fig halves. Place figs in a baking dish. Lightly brush prosciutto with olive oil. Bake in oven until prosciutto begins to crisp, about 15 minutes. Remove from oven and transfer figs to a platter. Remove baked rosemary sprigs and discard (they will be brown). Replace with a few fresh rosemary leaves, without stem. 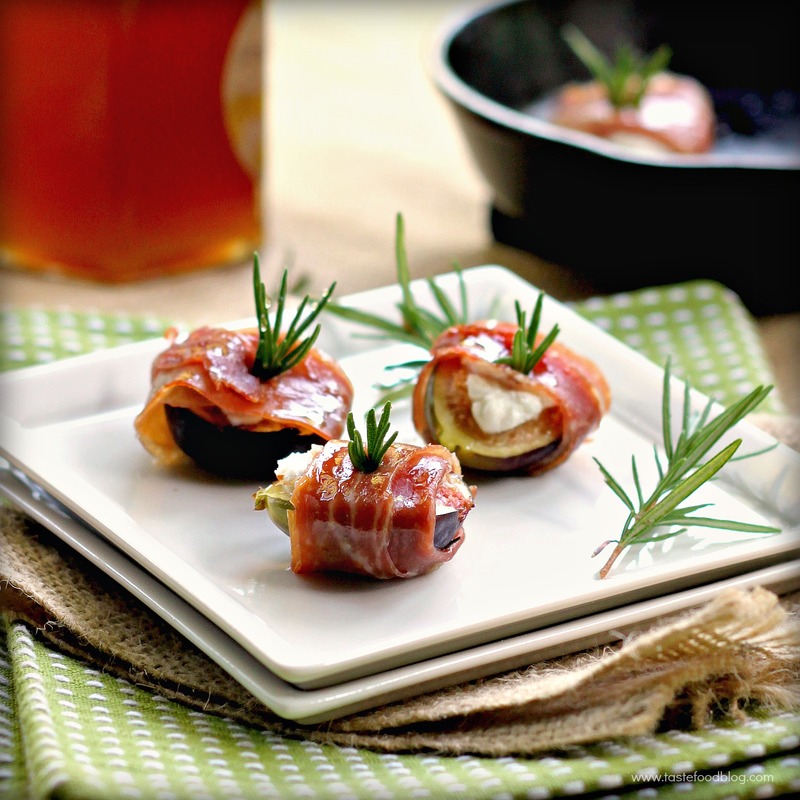 Lightly drizzle figs with honey. Sprinkle with lemon zest. Serve warm. 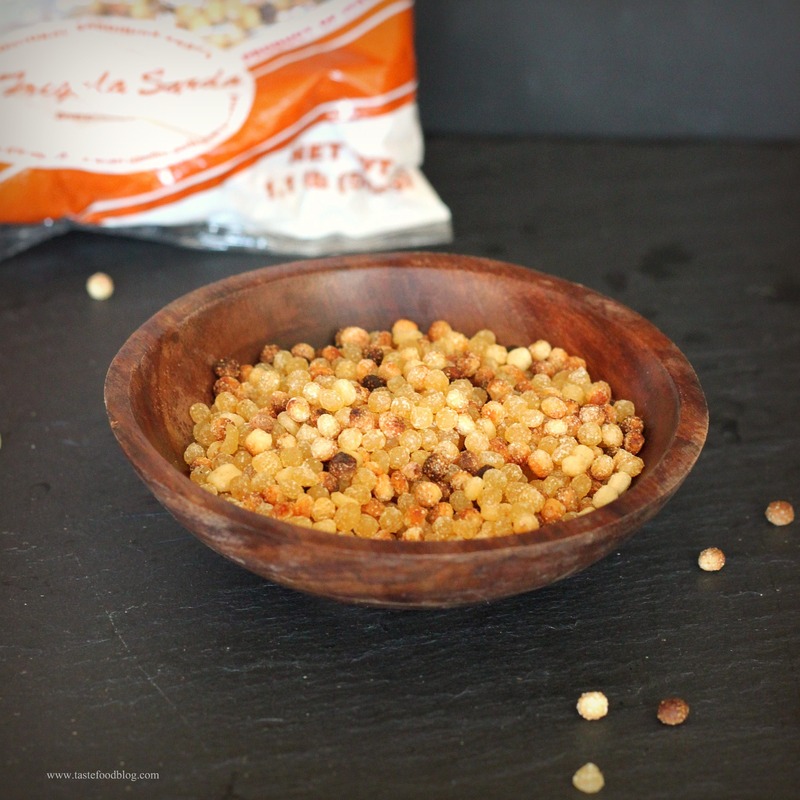 If you have never tried Fregola Sarda, then you should. Fregola (also known as fregula) is a semolina pasta hailing from Sardinia, Italy. It’s quite similar to pearl couscous which is made of wheat. It consists of tiny rolled balls which have been sun-dried then toasted, lending a satisfying and unique nutty flavor and mottled texture. 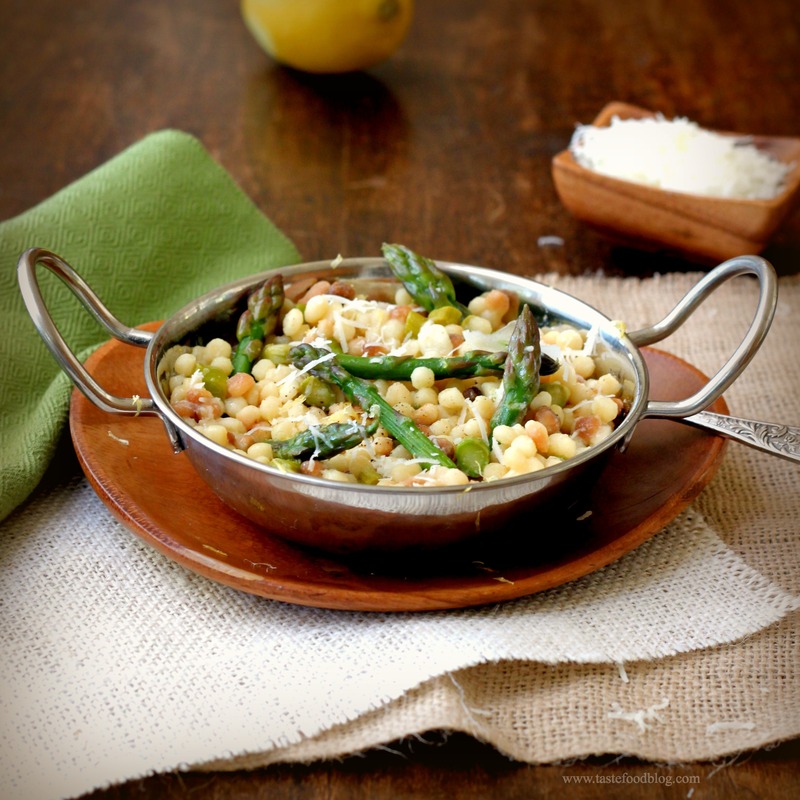 Fregola is delicious on its own, served simply with olive oil, sea salt and a dusting of cheese, in soups, or combined with vegetables and fresh herbs as a side dish or light meal. One would think that since I have a food blog, dinner is always a happening, gastronomic event in our home. Wouldn’t that be nice? However, as any multi-tasking writer/parent may attest, after a day of meeting deadlines, planning a cooking class, driving kids to and from activities, bringing the dog to the vet and paying bills, dinnertime rolls around and the “what’s for dinner?” question looms with a blank stare in response. The most unfair aspect of this situation is that the supermarket was bypassed on the way to the vet, and I have spent a good part of the day immersed in the food web drooling over photos and recipes by many talented bloggers. So to add misery upon misery, not only is the family famished and the refrigerator empty, I am craving a delicious home-cooked meal worthy of TasteSpotting. Yesterday this was the case. It was 6 pm, and I had no idea what to make for dinner. We were hungry, and the usual salad with cheese seemed so … wimpy. I pictured something warm and filling, a sturdy meal to feed a family. Peeking in the freezer, I spied a pound of frozen beef, and suddenly envisioned a Lady and the Tramp style platter of spaghetti with steaming red sauce and meatballs. The cook in me said, “Why not?” All the necessary ingredients were in the pantry. 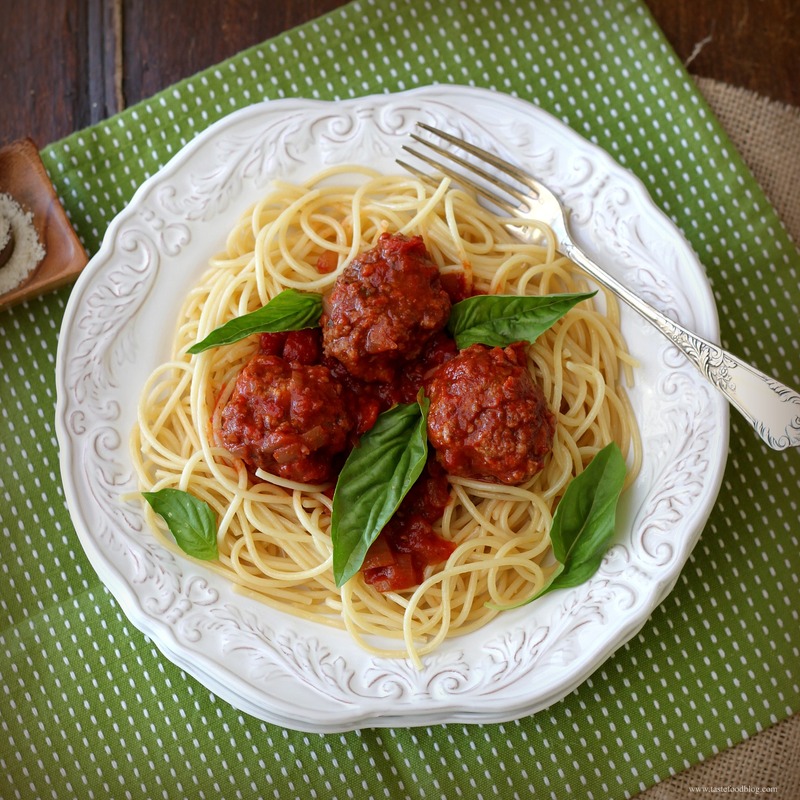 It would take less than an hour to prepare the meatballs and sauce, while filling the kitchen with tantalizing aromas as it simmered. I would rally and fight my fatigue. The reward was a perfectly delicious and rustic family-style dinner to launch the new week. Adapted from a recipe by Ina Garten. I used all beef for the meatballs (that’s what was in the freezer!) Feel free to substitute some of the beef with veal or pork. Serves 4. Combine the beef, prosciutto, breadcrumbs, cheese, parsley, oregano, salt pepper and nutmeg in a bowl. Add the egg and water and mix in with your hands. Lightly form into 1 1/2 inch meatballs. Heat olive and vegetable oil in a skillet over medium heat. Carefully add the meatballs in batches, without overcrowding. Brown on all sides, turning gently with tongs or a spatula. Remove and set aside on a plate lined with a paper towel. When all of the meatballs are browned, pour off the oil. 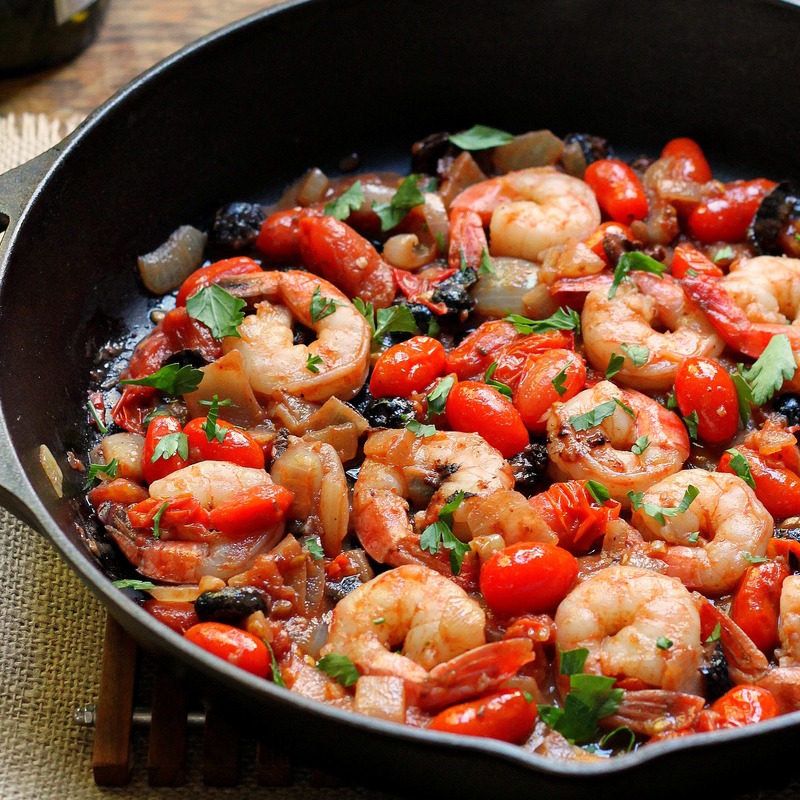 Without cleaning the skillet, add 1 tablespoon olive oil. Add onion and saute until softened, 3 minutes. Add garlic and saute 1 minute. Add wine and cook, scraping up any brown bits, until reduced by 2/3. Add tomatoes, breaking them up with a spoon. Add tomato paste, oregano, salt and pepper. Return meatballs to the skillet. Cover and simmer over low heat until the meatballs are cooked through, about 30 minutes. 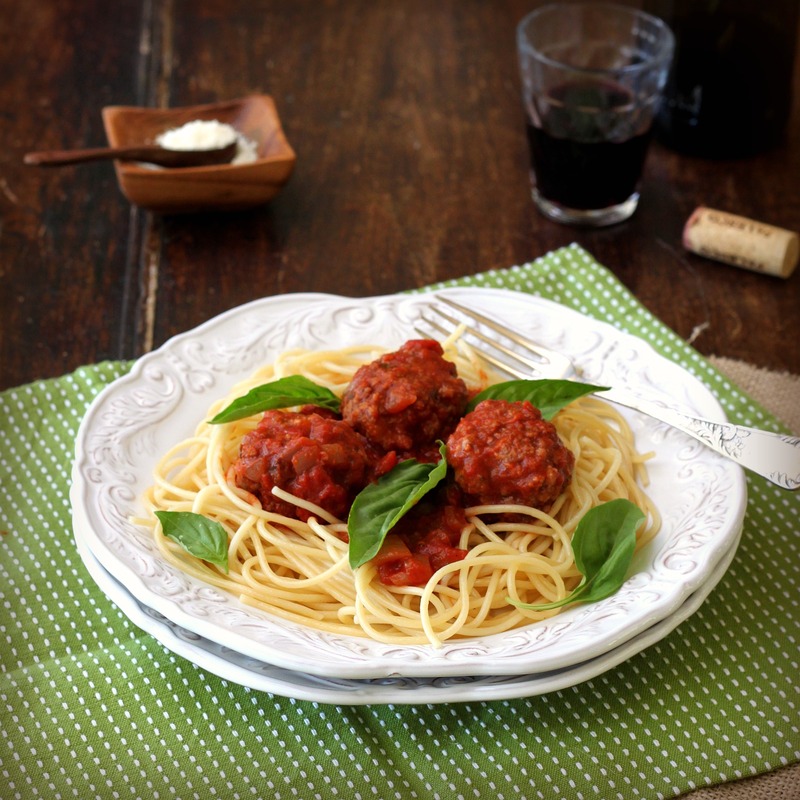 Serve over cooked spaghetti, garnished with grated cheese and basil leaves. My daughter announced the other day that she had just finished her 15th day of school. I was stunned. I could have sworn we had been back in the school routine for at least 3 months. Since the beginning of September life has been a whirlwind of family activity revolving around school, carpool, activities, homework, dinners, entertaining and birthdays. As the children have grown older, it seems that time has sped up even faster with more and more commitments to attend to, including my work. I’ve already lost track of days, my car keys, a pair of flip flops and multiple shopping lists. Yesterday was another blur, when at the end of day the inevitable question “What’s for dinner?” was directed to me and drew a blank stare. Luckily I had a stash of ricotta in the refrigerator, along with lasagna sheets in the pantry. A quick tomato sauce was easily prepared, and with a little assembly accompanied by a glass of red wine, a homey lasagna was produced to the satisfaction of all of us. This recipe creates a dry and hearty lasagna, with little excess liquid and chunks of vegetables in the tomato sauce. 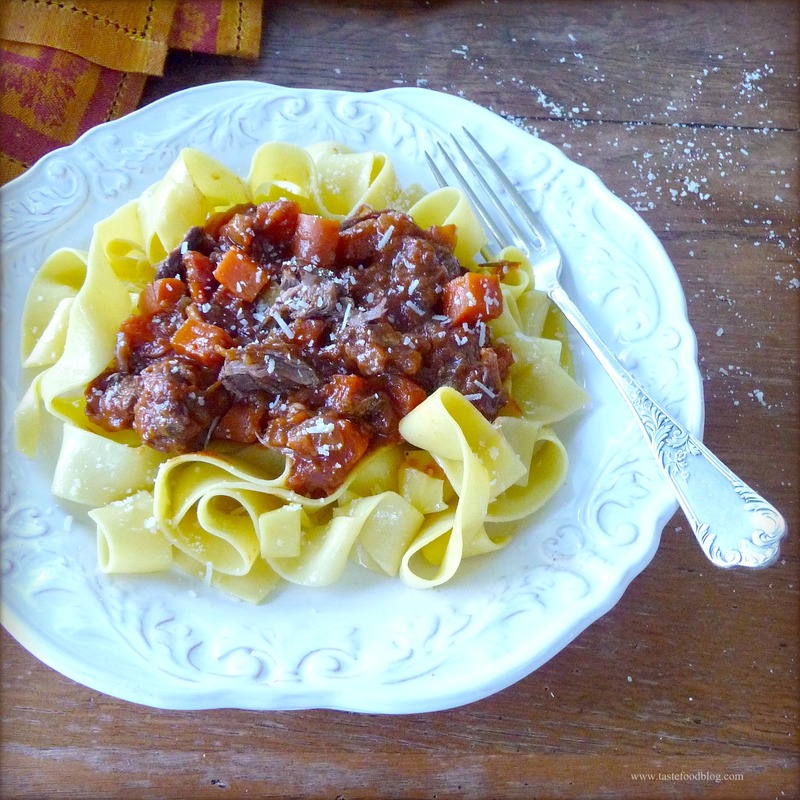 If you prefer meat in your tomato sauce, add 1/2 pound browned ground beef along with the tomatoes. Serves 4-6. Heat oil in a deep skillet over medium heat. Add garlic, onion, carrot, red pepper and saute until the onion wilts, about 4 minutes. Stir in basil and oregano and saute one minute. Add tomatoes with juice, tomato paste, bay leaf and wine. Bring to a boil and simmer uncovered 20 minutes. Add salt and pepper and taste to adjust seasoning. While the sauce is simmering combine all the filling ingredients in one bowl and mix well. Spoon a thin layer of tomato sauce in bottom of a deep baking dish. Lay a layer of dried lasagna sheets over the sauce, breaking the pieces if necessary to fit. Spread a layer of ricotta lightly over pasta. Drop spoonfuls of the tomato sauce over the cheese without covering the sauce (or the lasagna will be very wet). Evenly sprinkle with Parmigiano-Reggiano and mozzarella cheese. Repeat layering process until the last amount of ricotta has been used. Top the ricotta with tomato sauce and cheese. Bake in oven until bubbly and turning golden brown, about 45 minutes. Rumor has it that this summer has been one of the coolest on record in the San Francisco Bay area with even more fog than usual. Luckily, we missed most of it, but I am not gloating. Instead, we witnessed record breaking heat and torrential rains in Europe, 100 percent humidity on the East coast and the excuse to wear fleece in Iceland. This has, indeed, been a season of extreme weather (although, for Iceland, I think extreme is more the norm). Now we are home and experiencing some of that chilly San Francisco weather, but I can’t say that I mind. After all, summer is winding down, school is starting, and my New England DNA has me programmed to look forward to a brisk autumn season. Not only does the fresh air beget fires and woolies, it also invites cozy, rustic cooking. And what better way to start the season than with a casual, comforting Sunday supper? The heat of sausage mingles with earthy broccoli rabe and sweet red bell pepper. I like to serve this dish straight from the skillet, accompanied by a salad of mixed greens, fresh country-style bread and a glass of Côtes du Rhône. Serves 4. Cook pasta in a large pot of salted, boiling water until al dente; drain and set aside. While the pasta is cooking, bring another large pot of salted water to boil. Add broccoli rabe and blanch 30 seconds; drain. Plunge broccoli rabe into a bowl of ice water. Cool and drain again. Lay in one layer on a kitchen towel to thoroughly dry. Cut in 1″ pieces. Heat one tablespoon olive oil in a skillet over medium heat. Add crumbled sausage to the skillet. Sauté over medium heat until golden brown and cooked through. Transfer sausage to a plate lined with a paper towel. Pour off all but one tablespoon of accumulated oil in the skillet. Add garlic and crushed red pepper flakes. Sauté until fragrant, 30 seconds. Add red bell pepper, broccolil rabe, pepper and salt. Sauté one minute. Add sausage and cook until heated through. Remove skillet from heat. Add cooked pasta and cheese to the skillet; toss to combine. Serve with additional grated cheese on the side.